Nutritional supplements for rabbits include licks, vitamin and mineral supplements, and certain fruit supplements. 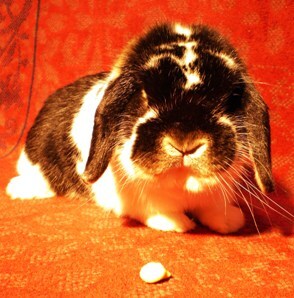 Many rabbit owners provide their animals with salt or trace mineral licks. Such items contain salt and other minerals a rabbit needs in its diet. Also, they may aid in wearing down the teeth and help provide enrichment or prevent boredom in the rabbit. Rabbits do not need a salt lick if they receive a complete feed. In general, commercial rabbit feeds contain appropriate amounts of the vitamins and minerals necessary to meet a rabbit’s nutrient requirements; therefore, no additional supplementation is necessary. So, a salt lick is an unnecessary addition if your rabbit remains on a high-quality commercial feed; however, providing one will not harm your rabbit. If you decide to provide a lick for your rabbit, attach it to the side of your rabbit’s cage, near the water source. As with salt licks, your rabbit does not need additional vitamin and mineral supplements if you provide a high-quality, complete commercial diet. In fact, experts discourage adding vitamins to a complete feed. Rabbits, like other animals, can develop vitamin imbalances or toxicities if they receive surplus amounts of certain vitamins. Nutrient requirements vary among species in relation to the specific nutrients needed and their proportional amounts. For example, rabbits require a balanced calcium-to-phosphorus ratio, and deviations from this ratio may result in poor nutritional status. Although many people are aware that hairballs (food/hair masses) are an issue for cats, some are surprised to learn that to some degree, rabbits are prone to hairballs as well. Rabbits that have hairball issues can experience gastrointestinal blockages and diarrhea. For these rabbits, papaya or pineapple supplements may be effective in eliminating or minimizing problems. Papaya and pineapple contain the enzymes papain and bromelain. These enzymes are believed to aid in the breakdown of proteins present in the food/hair mass, allowing for an easier passageway through the gastrointestinal tract. Some studies in humans show that bromelain also may act as an anti-inflammatory agent and provide some relief to those with gastrointestinal tract diseases. Similar benefits may be seen in rabbits that develop gastrointestinal stasis, but further research is required to evaluate these suppositions. In fresh fruit, often these enzymes are not present in quantities potent enough to provide a beneficial health effect; therefore, various concentrated supplements are available on the market for animal use. When offering supplements to your rabbit, use extreme caution because oversupplementation can lead to unwanted side effects. Initial studies in humans have shown that long-term supplementation may interfere with the effectiveness of some antibiotics and cause other side effects. If you decide to use a papaya or pineapple supplement, choose a supplement designed for rabbits rather than a human nutritional supplement. The dosage will be more accurate for the rabbit, thus reducing the risk of side effects. Providing small amounts of fresh pineapple or papaya also may help alleviate gastrointestinal issues or prevent them from occurring. The enzymes in frozen or processed fruits are not effective, however. Consult with your veterinarian before deciding to provide any nutritional supplements to your rabbit.